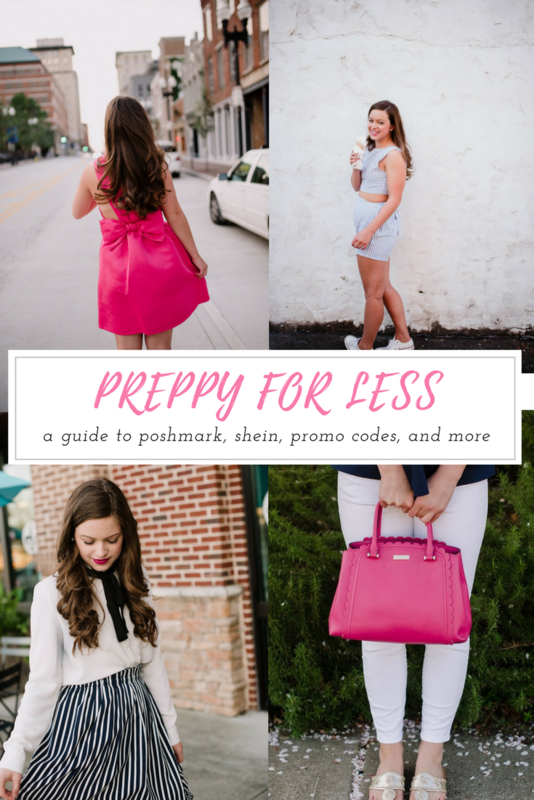 preppy for less: poshmark, shein, and promo codes! Today I have a post that has been highly requested from several of my followers as well as my own friends back at home! I'm talking preppy and classic clothes for less! I'm on a budget, as I'm sure many other college students are, so I'm always on the hunt for items from Poshmark, Shein, and sales. In this post I'm breaking down by all the sites I shop on as well as some tips I have for shopping sales. Let's get started! The easiest way to find cheaper preppy clothes is through Poshmark. I've had an account for about 2 years now, and I sell items there as well. I've made over $1000 from Poshmark and have purchased many of my favorite items from here. The key to Poshmark is to search for the brands you like. Many people struggle finding items on here, but you have to know exactly what you are looking for if you wan to purchase something. Take this skirt in the picture below for example. I had a friend who had this exact skirt and I wanted to purchase it, however it was several years old. I searched on Poshmark for "Banana Republic corduroy skirt" and within the first ten listings I found this one, which was exactly what I was looking for. I've also found a lot of luck by following other profiles that have similar styles as me. Search for your brands, such as Lilly Pulitzer, J.Crew, Kate Spade, etc. and find users that have those brands. I found this ruffled blouse (below) from a user that had similar style as me. Poshmark seems self-explanatory on the surface, and I hope I'm not being redundant, but you just need to know what you're looking for on this site or you'll become frustrated. I don't endlessly look for items on here. I go searching for items with a purpose, which I suggest you do too! Poshmark is also great because you can buy high-end items for way cheaper. Take this Kate Spade purse for example. I was on the hunt for a Kate Spade purse but wasn't willing to shell out the money for one. I searched on Poshmark for the style I wanted and came across this one. I made an offer on the listing (which I also suggest you do as this can save you money!) and was able to bring the price down about $30. If you are having trouble selling items on Poshmark, my first bit of advice is to list more than 10 items. Statistics show that users are more likely to sell items if they have above 10 listings. The more listings you have, the more exposure your closet will have. I also recommend sharing your listings to Posh "parties". These are themed parties hosted by various posh users. Many people endlessly search these parties, so share a couple items to these to get your closet out there. My final bit of advice is to follow a couple hundred closets as soon as you create your poshmark. Don't worry about following so many and clouding your feed- this is just so you can get your closet out there and find other users with similar taste. I know many people are hesitant about trying sites such as Shein, which are Chinese whole-sale fashion sites. However, I have ordered from Shein several times and have generally been impressed by the sizing and quality of the items. I always receive compliments while wearing anything I've purchased from Shein, and people are genuinely surprised when I tell them the prices of the items. Items on Shein range from $5-$30 on average, with a few exceptions for more high-end items. I've found that the best way to shop on Shein is to search by trend. They generally have the most recent trend items so you can be sure to stay on top of your style. Be sure to read the reviews as well so you can get a grasp on sizing and fit. I usually go one size up and that model has worked for me for just about everything I have purchased from the site. I also love Shein because you can receive points for your orders, posting reviews, and more. So you can earn "money" for shopping and use that towards your next order. Be sure to sign up for an account upfront so you can start saving immediately. I am sure that this next advice is obvious, but I want to include it just to remind you how helpful it can be. I know everyone hates receiving product emails, but sign up for emails from your favorite brands. I currently receive emails from J.Crew (and J.Crew factory), Kate Spade, Lilly Pulitzer, and Jack Rogers. This way I can be alerted for sales but also not be overwhelmed with a million emails. J.Crew factory has sales almost every week, so I check the site frequently even without receiving emails. Another tip is to always use promo codes when shopping. If the website doesn't mention any sales, check on Retail Me Not just in case. I love shopping online rather than in stores because you can take full advantage of all the sales. I hope you find this post helpful. If you have any questions about poshmark or shein, please leave me a comment! 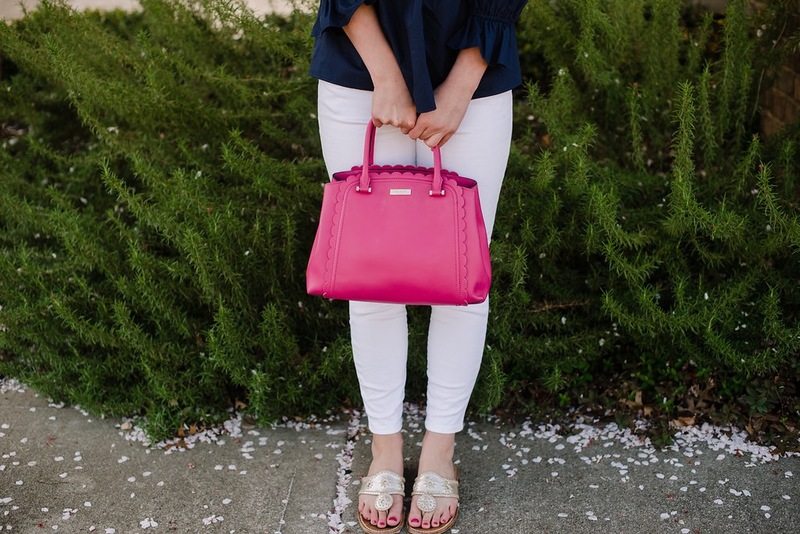 What tips do you have for purchasing preppy items for less? Where can I get gorgeous hair like yours? They are absolutely stunning. I really like the different tops you are wearing. I am looking forward to shopping from this place you have mentioned.